At the beginning of December, the World Bank released the 16th edition of the Kenya economic update report. This year’s report focuses on the slowdown in private credit growth in the country and the need for increased revenue mobilization. 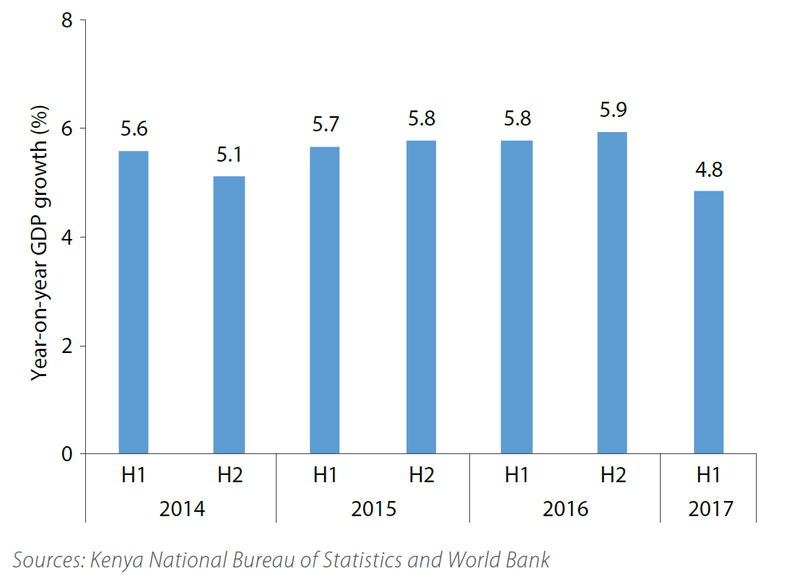 As Figure 1 shows, in the first half of 2017, Kenya’s economic growth slowed and the economy grew at 4.8 percent, its slowest pace since 2014. The slowdown in private sector credit growth also started in late 2014 and continued into 2017, as seen in Figure 2. According to the report, the impact of the slowdown is being felt across all sectors of the Kenyan economy. As Figure 3 shows, credit growth in every sector was lower in 2016-17 compared to 2014-15. According to the report, several domestic and external factors contributed to the credit slowdown. 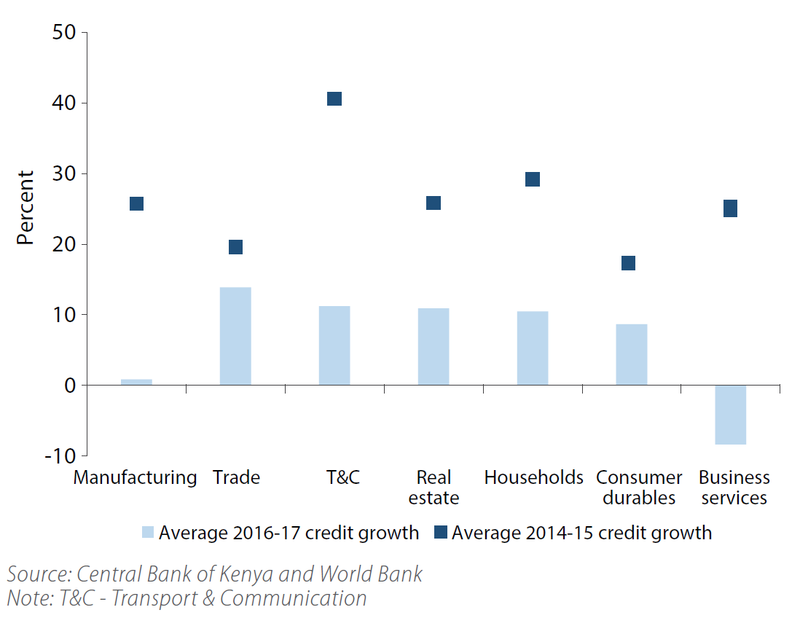 Global capital outflows from emerging and frontier economies in 2015 affected Kenya as liquidity in the banking sector fell, restricting credit growth. In 2016, rising non-performing loans forced banks to reduce lending, hence restricting credit supply. 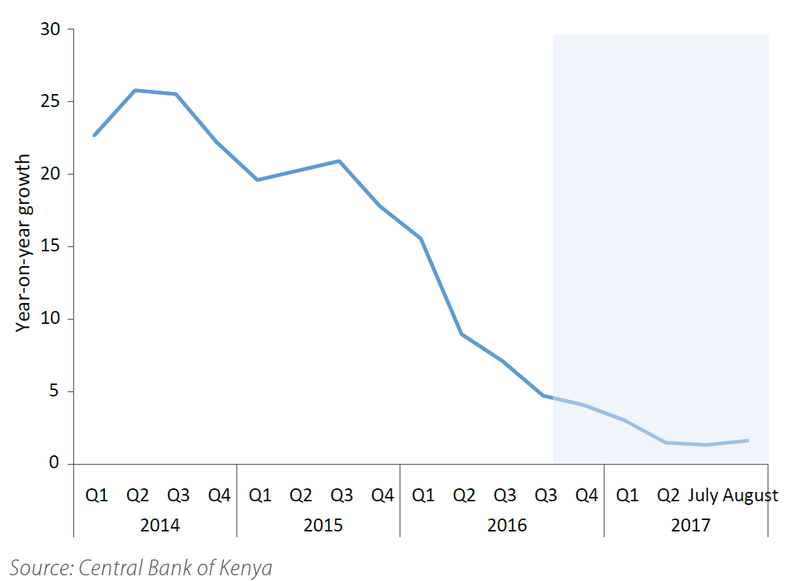 Behind public pressure, in September 2016, the Central Bank of Kenya set a floor for deposit rates at 70 percent of the central bank rate and a ceiling for rates on loans around 4 percent above the central bank rate. The central bank rate is the interest rate at which banks can borrow from the central bank. This move had several unintended consequences as it reduced the share of first-time borrowers at banks in half as banks shied away from lending to new and unknown customers. According to the report, it also raised bank investment in government securities at the expense of private borrowers as they paid between 11-12.5 percent compared to the cap set around 14 percent. The report provides several recommendations for policymakers including the removal of interest rate caps to allow broader access to credit, deepening financial inclusion by increasing financial literacy, implementing consumer protection laws to tackle predatory lending, and accelerating the resolution of non-performing loans. Finally, it recommends improved management of public finances and reduction in fiscal deficits to increase the availability of credit to the private sector as government borrowing crowds out private borrowers.